Home » Blog » Just what is Nigel Farage up to? Well, one glance at the papers over the past few days and it’s pretty clear that Nigel Farage is back in a big way. He’s rather grandly attempting to shape the Brexit debate, reinvigorate – if not relaunch – the Leave campaign and position himself as the Great Saviour of the referendum result of 23 June 2016. Not that Farage has ever exactly gone away; but his credibility as an influential politician has been in steady but sure decline for over a year. 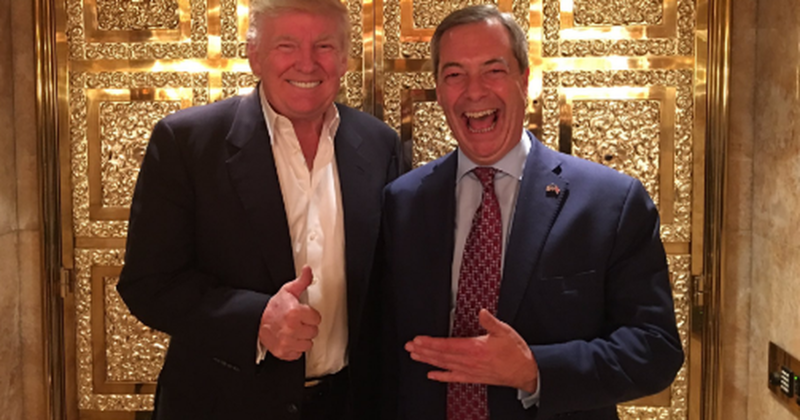 He may have been the first foreign politician to visit Donald Trump following his election; but, as reported by commentators such as The Independent’s Joe Watts (2016) any hope Farage had that Theresa May might use him as go-between with Trump were swiftly dashed by Downing Street. Then there was the disastrous endorsement of far-right Republican Ray Moore in the Autumn 2017 campaign for one of Alabama’s Senate seats. Not only did Moore lose the election in large part due to serious allegations of sexual assault but Farage foolishly defended Moore against the allegations – as reported by The Independent’s Andrew Buncombe (2017a). Perhaps the nadir of Farage’s post-referendum political life was last Monday 8th’s meeting with EU chief Brexit negotiator Michel Barnier. Despite Farage’s best efforts, the reports there were of this non-event meeting were relegated to the inside pages of the papers and mostly below the top stories on the TV news broadcasts. From a Gravesian perspective Farage is dominated in his political life by a RED/BLUE vMEME harmonic, making him a zealot. A zealot without something to be zealous about is indeed ‘lost’, in Hyde’s words. After giving more than 20 years to the cause of leaving the EU, what else was there for Farage to do once the Government had triggered Article 50…? Yet just 3 days after the Barnier meeting, Farage made his astonishing assertion on Channel 5’s The Wight Stuff – see video below – that he was coming around to the idea of a second referendum on membership of the EU. Instantly, he was back on the front pages and TV headline news. So, just what is Farage up to? In and amongst the deluge of analysis which has followed that remarkable broadcast, it’s helpful to take some sociopsychological views on what is happening. So, if he is high in Psychoticism, it would be characteristic of Farage to impulsively state something without necessarily having thought it through – especially if the zealot in him were aroused, giving him a RED-psychoticist centre of gravity, excelling in the moment without thought of consequences. Clearly, from his comment on The Wright Stuff, Farage was irked by Tony Blair’s latest attempt to derail Brexit by making the case for a second referendum – as reported by the likes of the Daily Telegraph’s Steven Swinford. So his sudden apparent near-conversion to a second referendum, with the threat to “just finish the whole thing [resistance to Brexit] off”, may have been the kind of bring-it-on invitation to a fight that is typical of thoughtless and impulsive Psychoticism when threatened. The comments of Diane James, briefly Farage’s successor as UKIP leader on the Thursday (11th) evening edition of BBC’s Newsnight – see video below – are more than a little interesting. James makes no bones about UKIP being surprised – if not taken aback – by Farage’s comments. Then she says he’s “got form” for “outrageous statements”, effectively belittling him as not to be taken too seriously. However, she then uses empathising with his “frustration” as the starter to make her own complaints about Remainers. Very clever! You could almost see UKIP beginning to handle the situation and creating a sense of bringing Farage under control. BLUE and ORANGE, with the slightest hint of GREEN, were moving to wrap charismatic Farage back up in the party machine. It looks like Mr Impulsive had been tamed, rehoned and refocussed to get the Brexiteers back to work and moving the Brexit debate away from the centre and the discussion around what kind of ‘soft’ Brexit could be achieved. With Farage and UKIP back in business, there could be more of a move towards a ‘hard’ and fast Brexit. Also, it’s an unlikely coincidence that Farage has re-emerged in such a formidable manner at the end of the very week current UKIP leader Henry Bolton – largely seen as ineffective – has been under intense pressure to resign over his partner sending racist texts about Meghan Markle (BBC, 2018a). Bolton stepping down now would be perfect timing for Farage to resume his role as the uncrowned king of UKIP. if the above sounds almost like a conspiracy theory, then we have to remember who Farage is really working for: the Plutocracy. As outlined in How the Plutocrats are waging War on the Bureaucrats…, the Plutocracy – Guy Standing’s (2009) term for the super-rich 1% – dominated by unhealthy ORANGE, are extending their control of the world through their elitist lackeys working against the BLUE-driven bureaucracies whose rules and regulations constrain their otherwise unrestricted profit-making-at-all-costs. The hard right-wing crusade against the European Union is a part of this ‘war’ and Brexit a key strategy to starting the dissemblement of this regulation-heavy institution. Farage and UKIP were critical to the success of the Brexit strategy in the referendum. Unfortunately for the plutocrats, Brexit has not been going well. Led by Barnier and Angela Merkel, the bureaucrats have played hardball and consistently outplayed Theresa May’s Brexit team fronted by the jovial but amazingly-unspectacular David Davis. Along with the EU’s hardball, the plunge in sterling, the flight (and further threatened flight) of top agencies, bank sections and capital – not to mention Liam Fox’s total failure to rustle up even a whisper of a post-EU trade deal – has made the UK’s position in the negotiations incredibly weak. The result has been that May has made some concessions towards a softer Brexit while simply getting in an apparently-unresolvable muddle over issues like the Irish border. Only the dogged insistence of Jeremy Corbyn – a zealot of a different kind – that the UK should leave the EU, the Single Market and the Customs Union – in a clear policy division with Shadow Brexit Secretary Keir Starmer – has arguably prevented the Brexit process from being even more stalled than it is. However, with Labour’s Chuka Umunna building a cross-party anti-Brexit group with Tory rebels like Dominic Grieve and Anna Soubry and the House of Lords very pro-Remain, May is having (and going to have) major problems getting her Brexit legislation through without rebellions and/or amendments. Beyond Parliament the likes of A C Grayling and Gina Miller are just some of the leading figures involved in legal challenges to Brexit, according to HuffPost’s Richard Bird. No wonder Farage is irked and the plutocrats all too ready to use him, UKIP and, undoubtedly, their elitist media moguls like Rupert Murdoch and the Barclay Brothers to get their anti-EU machine firing on all cylinders again. When Farage made his extraordinary statement last Thursday, with hours his billionaire backer Aaron Banks was tweeting his support. The Plutocracy and their elitist lackeys knew they had to get Farage on board but focussed on what they wanted him to be attacking. Controlling an impulsive loose cannon like Farage is, of course, no easy task but they’ve done it before and no doubt they will do it again. 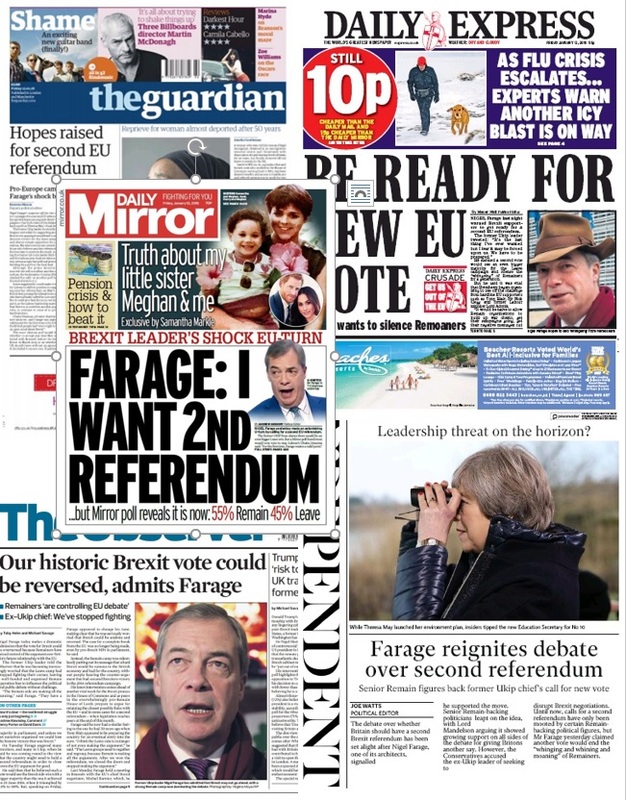 In the coming weeks it will be no surprise to see Farage resume leadership of UKIP and the like of the Daily Mail, The Sun and the Daily Express increase coverage of the Brexit debate and express increased vitriol towards both Remainers and the EU. The tragedy in all this is that, as Abraham Maslow (1971) said, “Any transcender [TURQUOISE thinker] could sit down and in five minutes write a recipe for peace, brotherhood, and happiness, a recipe absolutely within the bounds of practicality, absolutely attainable.” Yet there is little or no observable 2nd Tier thinking in UK politics to see that, yes, the EU needs serious reform – as I discussed in Whither the EU..? – but the UK should be leading that reform, not walking out into political, social and economic obscurity. Perhaps, if Chuka Umunna can create a genuine cross-party understanding that transcends party loyalties in the national interest AND can see how to create a buy-in for moderate Brexiteers, then maybe there might be some hope for more complex thinking amongst our decidedly partisan and simplistic-thinking politicians.